Absorbine Horseman's one Step Leather Cleaner & Conditioner. 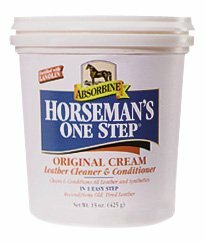 Releases deep-down dirt and grime, gently lifting away then preserves and conditions the leather to keep it soft and pliable. Protects against mold, drying and cracking, while leaving a beautiful satin sheen, all in one easy step. 15 oz.